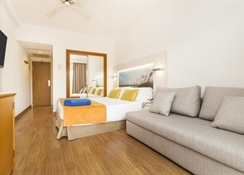 The Globales Pionero Hotel in Santa Ponsa sits barely 350 metres the beach, where you can kick back on the sunny sands or get into the waters to enjoy tons of watersports. The hotel houses three adult swimming pools and two separate pools for kids, with a cosy sun terrace where you can relax on sun-beds. You can also play tennis and volleyball with the family, besides trying water polo and aqua aerobics. Sample international and local treats at the buffet and a la carte restaurant or drop in at the pizzeria and snack bar for light eats. The rooms are spacious, with special facilities for the handicapped. There’s also a golf course at about 900 metres from the hotel, with two more a little further away. You can also down to the harbour about 1.5 km away to explore restaurants, bars and shops. Drive down to spend the day at Palma, the capital city, 19 km from the hotel or visit the seaside towns of Costa de la Calma, El Toro and Cala Fornells. 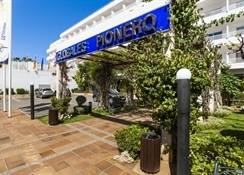 The Globales Pionero Hotel in Santa Ponsa is about 350 metres from the beach. 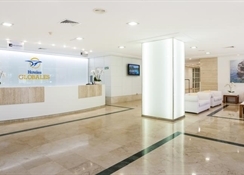 Palma, the capital city, is 19 km from the hotel, while the Palma de Mallorca Airport is 29 km. Golf Santa Ponsa (900 metres) is the nearest golf course from the hotel, while the harbour is about 1.5 km away. Globales Pionero Santa Posna Park Hotel features 24 single rooms, 312 double rooms and 6 handicap rooms, with attached balconies and terraces. It also offers wall-mounted fold-away shower seats and pool hoist. Look forward to buffet meals and theme dinners at the main restaurant, which serves an international range of dishes. You can also order light meals and cocktails at the pool bar or drop in at the Pizzeria for sumptuous pizzas. For a fine selection of wines and local as well international liquor, check out the Bar & Lounge. 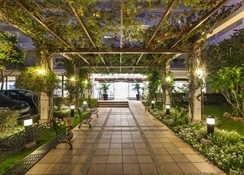 The hotel has sports installations like a tennis court, multi-sports court and mini-golf. 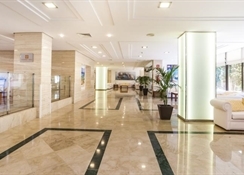 Additionally, there is an aerobic gymnasium, sauna room, Jacuzzi, Turkish bath, massage therapies and more. There is a shopping area in reception, which includes a mini-market, unisex hairdresser’s, national and international press, and souvenirs. Other than that, the hotel has a large pool, 2 rooftop plunge pools and one kids’ pool. 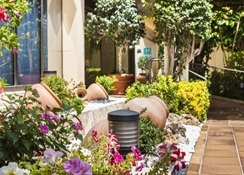 For those who wish to pamper themselves can try the hotel’s sauna or Turkish bath. The little ones will be kept busy with the hotel-run kids’ club. Good food, clean, great kids ents team, but don't go if you want a relaxing holiday. Never any sunbeds left, even at 6am and management unhelpful. Barely enough chairs if you don't get a sunbed........ Very noisy and busy. Too much for me, I won't be going back.